Many people think that you can buy a sign, plop it out front, and expect loads of new business to roll in. Anyone who’s ever worked in advertising and marketing knows there’s more to it than that. Mistake #1: The wrong material. You might think that a brilliant wood sandblasted sign is a great thing—and indeed it is. But when you put it in the lobby, you’re only showing off that sign to people who are already in your business. The point of a highly valuable sign is to entire people to enter your building in the first place; if you don’t match the right material to the right placement, you’re not going to get as much value out of your signage as you can. What’s an example of a great, clear sign? It’s one you see every day: the STOP sign. It’s bold, it’s high-contrast, and it has a clear message. That’s the kind of simplicity you should strive for with your own signs. Admittedly, it’s going to be hard to whittle down your company’s message to just one word. But consider this: the fewer words you use, the more space you’ll have for a big, attention-getting word. For the same reason you don’t publish a menu with 200 options, you don’t want a sign that tells people too much. You want to do just enough to entice attention and give them the information to take the next step…but not any more than that. Otherwise you risk information overload and never getting any message through. 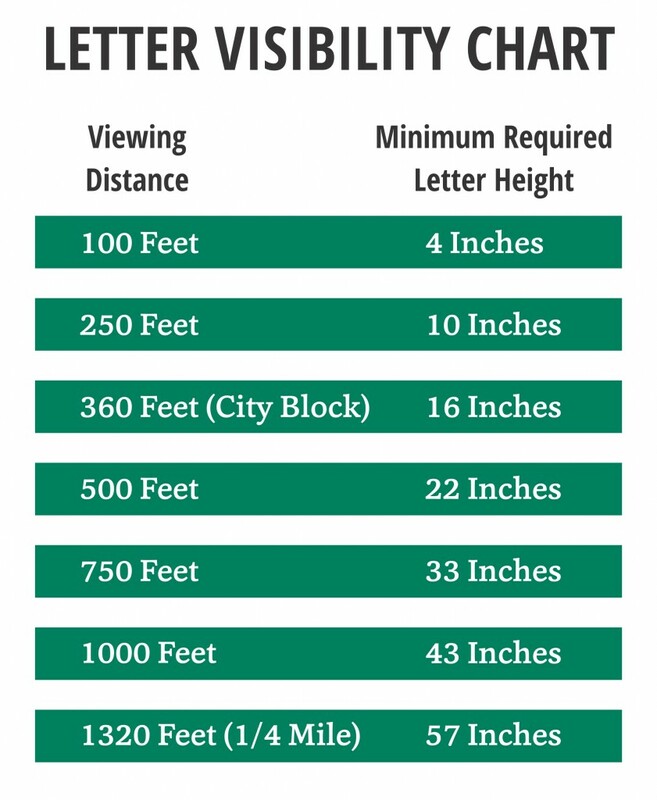 Consider this sign visibility chart you can see at Forbes. The larger your letters are, the more access you’re going to get to the eyes that come across your sign. Too many companies make the mistake of making a sign with “normal” lettering, only to see that when they place their sign outside, their message is absolutely lost. You have to remember that you’re advertising to pedestrians, cars, and more—and you have to know what it will take physically to attract attention. If these seems like a lot to digest, then make sure that you work with a signage company you can trust. Contact Sign It Quick for our advice on marketing your sign, crafting your sign, and using it to attract attention to your business. We’ll be glad to make specific recommendations for getting your business noticed—and for avoiding the same mistakes you see here. And if you can avoid the same mistakes your neighbors are making, guess where your potential customers will be drawn?